The Market Theatre, which opened in January 2000, is owned and run for the community by Ledbury Amateur Dramatic Society (LADS). It combines the intimacy of the Old Market Theatre with modern purpose-built facilities. It provides a dedicated venue for amateur and professional performing arts, and is of enormous benefit to the town and the surrounding area. A seating capacity of 128 in 8 raked and staggered rows. A flexible front-of-house area (foyer) that is suitable for social, rehearsal or studio performance uses. A small bar, which is part of the foyer. A balcony overlooking the foyer, which can be used as a Musicians’ Gallery. The spindles for this were turned on a traditional pole lathe from green oak by local craftswoman, Gudren Leitz, who carried out the same task for Shakespeare’s Globe Theatre in Southwark, London. A stage area that overcomes the height and width restrictions experienced in the old theatre. This can provide additional seating. 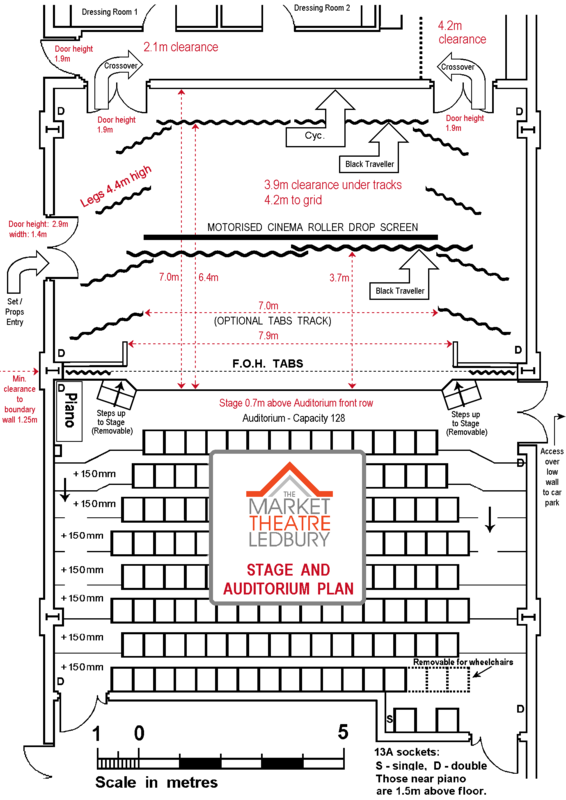 Disabled facilities that include level wheelchair access to the foyer, auditorium, stage and backstage. There is also a loop for the hard of hearing. Dressing rooms and a workshop area. The whole building, or just the Foyer or the Auditorium, is available for hire. The Auditorium is suitable for concerts, meetings, etc, as well as for theatrical events. The Foyer is ideal for small wedding receptions, club dinners, etc. or may be downloaded as a PDF here. Click here to download the list of lighting and sound equipment that is available, or here for a plan view of our 60 stage lighting circuits. Please note that a PDF reader is required to view these files. Click here to see how we modified our Strand Patt. 23 spots to get them through the PAT test. Some of our members are now qualified to conduct PAT tests themselves, via the PASS Portable Appliance Testing DVD course and exam. providing a dedicated venue for amateur and professional performing arts.